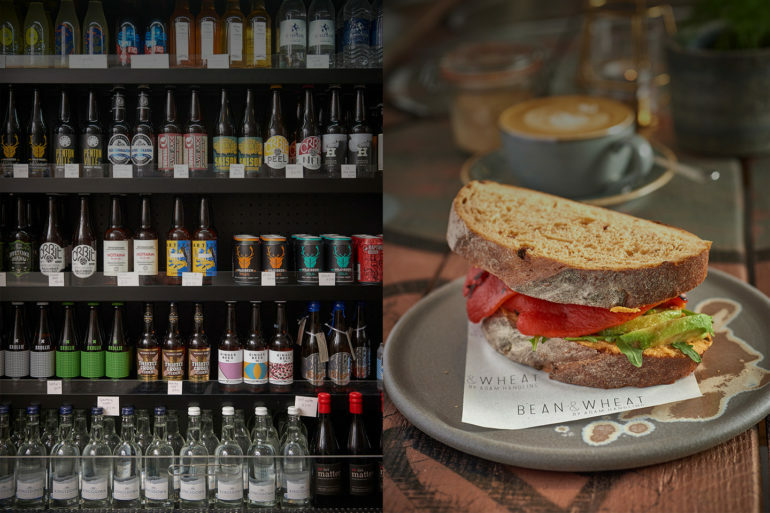 Located on Hoxton’s bustling Old Street, Bean & Wheat is now open for business, offering delicious and sustainable coffee-shop and deli treats, and a new craft beer library featuring 280 craft beers from small suppliers, all to eat on the premises, or to grab and go. Conceived by critically-acclaimed chef Adam Handling, Bean & Wheat focuses on reducing waste across an array of delicious and innovative sandwiches, salads, parfaits and preserves. Freshly made on site every day, the food at Bean & Wheat cleverly utilises off-cuts and surplus foods from Adam’s other food and drink venues (Frog by Adam Handling, EVE Bar, The Frog Hoxton and Iron Stag Bar) – from an earthy bean hummus drizzled with herb oil made using the tops of herbs not used in the restaurants, to fresh salads using cauliflower stalks, or classic sandwiches made with leftover salmon, smoked in-house, that would ordinarily be wasted after filleting. What’s more, alongside the exquisite seasonal blend coffees from Union Hand-Roasted Coffee, and fresh juices from Adam’s Black & White Juice range, the move to Hoxton sees an exciting addition for Bean & Wheat’s drink offering in the form of an impressive and extensive craft-bottle beer shop. Bean & Wheat’s new beer library is packed full of intriguing and artisanal beers that have been hand-selected by Adam himself, available both to drink in, or to take-away. And, in keeping with Bean & Wheat’s sustainable outlook, there’s a new recycling initiative in place – where any customer can bring back empty beer bottles in exchange for a free coffee.